Principles of Finance Featured: Boundless: Finance: "Chapter 2, Section 2: The Income Statement"
Boundless: Finance: "Chapter 2, Section 2: The Income Statement"
The income statement, or profit and loss statement (P&L), reports a company's revenue, expenses, and net income over a period of time. The income statement consists of revenues and expenses along with the resulting net income or loss over a period of time due to earning activities. The income statement shows investors and management if the firm made money during the period reported. The operating section of an income statement includes revenue and expenses. Revenue consists of cash inflows or other enhancements of assets of an entity, and expenses consist of cash outflows or other using-up of assets or incurring of liabilities. The non-operating section includes revenues and gains from non-primary business activities, items that are either unusual or infrequent, finance costs like interest expense, and income tax expense. The "bottom line" of an income statement is the net income that is calculated after subtracting the expenses from revenue. It is important to investors - also on a per share basis (as earnings per share, EPS) - as it represents the profit for the accounting period attributable to the shareholders. The difference between net sales and the cost of goods sold. Gross profit minus operating expenses and taxes. The income statement is a financial statement that is used to help determine the past financial performance of the enterprise, predict future performance, and assess the capability of generating future cash flows . It is also known as the profit and loss statement (P&L), statement of operations, or statement of earnings. The income statement consists of revenues (money received from the sale of products and services, before expenses are taken out, also known as the "top line") and expenses, along with the resulting net income or loss over a period of time due to earning activities. Net income (the "bottom line") is the result after all revenues and expenses have been accounted for. The income statement reflects a company's performance over a period of time. This is in contrast to the balance sheet, which represents a single moment in time. The income statement can be prepared in one of two methods: single or multi-step. The Single Step income statement totals revenues, then subtracts all expenses to find the bottom line. The more complex Multi-Step income statement (as the name implies) takes several steps to find the bottom line. First, operating expenses are subtracted from gross profit. This yields income from operations. Then other revenues are added and other expenses are subtracted. This yields income before taxes. The final step is to deduct taxes, which finally produces the net income for the period measured. 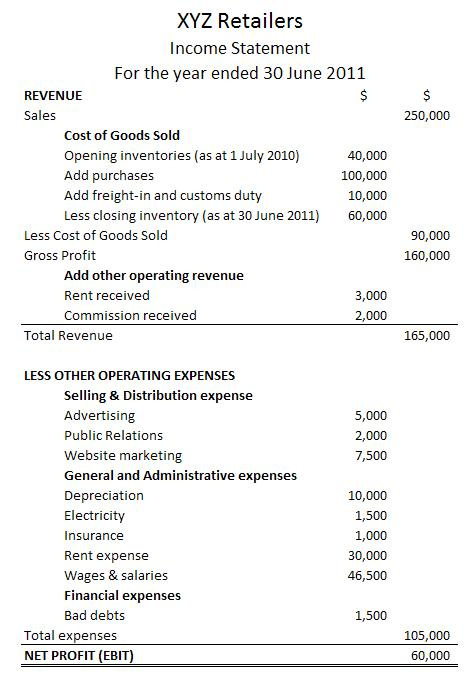 The operating section includes revenue and expenses. Revenue consists of cash inflows or other enhancements of the assets of an entity. It is often referred to as gross revenue or sales revenue. Expenses consist of cash outflows or other using-up of assets or incurrence of liabilities. Cost of Goods Sold (COGS): the direct costs attributable to goods produced and sold by a business. It includes items such as material costs and direct labor. Selling, General and Administrative Expenses (SG&A): combined payroll costs, except for what has been included as direct labor. Depreciation and amortization: charges with respect to fixed assets (depreciation) and intangible assets (amortization) that have been capitalized on the balance sheet for a specific accounting period. Research & Development (R&D): expenses included in research and development of products. The non-operating section includes revenues and gains from non- primary business activities (such as rent or patent income); expenses or losses not related to primary business operations (such as foreign exchange losses); gains that are either unusual or infrequent, but not both; finance costs (costs of borrowing, such as interest expense); and income tax expense. In essence, if an activity is not a part of making or selling the products or services, but still affects the income of the business, it is a non-operating revenue or expense. Certain items must be disclosed separately in the notes if it is material (significant). This could include items such as restructurings, discontinued operations, and disposals of investments or of property, plant and equipment. Irregular items are reported separately so that users can better predict future cash flows. The "bottom line" of an income statement—often, literally the last line of the statement—is the net income that is calculated after subtracting the expenses from revenue. It is important to investors as it represents the profit for the year attributable to the shareholders. For companies with shareholders, earnings per share (EPS) are also an important metric and are required to be disclosed on the income statement. Income statements have several limitations stemming from estimation difficulties, reporting error, and fraud. Income statements include judgments and estimates, which mean that items that might be relevant but cannot be reliably measured are not reported and that some reported figures have a subjective component. With respect to accounting methods, one of the limitations of the income statement is that income is reported based on accounting rules and often does not reflect cash changing hands. Income statements can also be limited by fraud, such as earnings management, which occurs when managers use judgment in financial reporting to intentionally alter financial reports to show an artificial increase (or decrease) of revenues, profits, or earnings per share figures. Method for accounting for inventory. LIFO stands for last-in, first-out, and assumes that the most recently produced items are recorded as sold first. Method for for accounting for inventories. FIFO stands for first-in, first-out, and assumes that the oldest inventory items are recorded as sold first. According to the principle, expenses are recognized when obligations are (1) incurred (usually when goods are transferred or services rendered, e.g. sold), and (2) offset against recognized revenues, which were generated from those expenses, no matter when cash is paid out. In cash accounting—in contrast—expenses are recognized when cash is paid out. Income statements are a key component to valuation but have several limitations: items that might be relevant but cannot be reliably measured are not reported (such as brand loyalty); some figures depend on accounting methods used (for example, use of FIFO or LIFO accounting); and some numbers depend on judgments and estimates. In addition to these limitations, there are limitations stemming from the intentional manipulation of finances. One of the limitations of the income statement is that income is reported based on accounting rules and often does not reflect cash changing hands. This could be due to the matching principle, which is the accounting principle that requires expenses to be matched to revenues and reported at the same time. Expenses incurred to produce a product are not reported in the income statement until that product is sold. Another common difference across income statements is the method used to calculate inventory, either FIFO or LIFO. Accounting for inventory can be done in different ways, leading to differences in statements. In addition to good faith differences in interpretations and reporting of financial data in income statements, these financial statements can be limited by intentional misrepresentation. One example of this is earnings management, which occurs when managers use judgment in financial reporting and in structuring transactions to alter financial reports in a way that usually involves the artificial increase (or decrease) of revenues, profits, or earnings per share figures. The goal with earnings management is to influence views about the finances of the firm. Aggressive earnings management is a form of fraud and differs from reporting error. Managers could seek to manage earnings for a number of reasons. For example, if a manager earns his or her bonus based on revenue levels at the end of December, there is an incentive to try to represent more revenues in December so as to increase the size of the bonus. While it is relatively easy for an auditor to detect error, part of the difficulty in determining whether an error was intentional or accidental lies in the accepted recognition that calculations are estimates. It is therefore possible for legitimate business practices to develop into unacceptable financial reporting. GAAP's assumptions, principles, and constraints can affect income statements through temporary (timing) and permanent differences. Explain the reason there is a difference between pretax income and taxable income. Items that create temporary differences due to the recording requirements of GAAP include rent or other revenue collected in advance, estimated expenses, and deferred tax liabilities and assets. Also there are events, usually one-time events, which create "permanent differences," such as GAAP recognizing as an expense an item that the IRS will not allow to be deducted. The four basic principles of GAAP can affect items on the income statement. These principles include the historical cost principle, revenue recognition principle, matching principle, and full disclosure principle. An estimate of the market value of a property, based on what a knowledgeable, willing, and unpressured buyer would probably pay to a knowledgeable, willing, and unpressured seller in the market. An estimate of fair market value may be founded either on precedent or extrapolation but is subjective. Fair market value differs from other ways of determining value, such as intrinsic and imposed value. Of or pertaining to a value that is not realized until a future date, e.g. annuities, charges, taxes, income, either as an asset or liability. Although most of the information on a company's income tax return comes from the income statement, there often is a difference between pretax income and taxable income. These differences are due to the recording requirements of GAAP for financial accounting (usually following the matching principle and allowing for accruals of revenue and expenses) and the requirements of the IRS's tax regulations for tax accounting (which are more oriented to cash). GAAP and IRS accounting can differ. Such timing differences between financial accounting and tax accounting create temporary differences. For example, rent or other revenue collected in advance, estimated expenses, and deferred tax liabilities and assets may create timing differences. Also, there are events, usually one time, which create "permanent differences," such as GAAP, which recognizes as an expense an item that the IRS will not allow to be deducted. The historical cost principle: It requires companies to account and report based on acquisition costs rather than fair market value for most assets and liabilities. The revenue recognition principle. It requires companies to record when revenue is (1) realized or realizable and (2) earned, not when cash is received. The matching principle. This governs the matching of expenses and revenues, where expenses are recognized, not when the work is performed or when a product is produced, but when the work or the product actually makes its contribution to revenue. The full disclosure principle. This suggests that the amount and kinds of information disclosed should be decided based on a trade-off analysis, since a larger amount of information costs more to prepare and use. GAAP reporting also suggests that income statements should present financial figures that are objective, material, consistent, and conservative. Non-cash items, such as depreciation and amortization, will affect differences between the income statement and cash flow statement. Non-cash items should be added back in when analyzing income statements to determine cash flow because they do not contribute to the inflow or outflow of cash like other gains and expenses eventually do. Depreciation refers to the decrease in value of assets and the allocation of the cost of assets to periods in which the assets are used--for tangible assets, such as machinery. Amortization is a similar process to deprecation when applied to intangible assets, such as patents and trademarks. The state of being obsolete—no longer in use; gone into disuse; disused or neglected. The distribution of the cost of an intangible asset, such as an intellectual property right, over the projected useful life of the asset. Non-cash items that are reported on an income statement will cause differences between the income statement and cash flow statement. Common non-cash items are related to the investing and financing of assets and liabilities, and depreciation and amortization. When analyzing income statements to determine the true cash flow of a business, these items should be added back in because they do not contribute to inflow or outflow of cash like other gains and expenses. Fixed assets, also known as a non-current asset or as property, plant, and equipment (PP&E), is an accounting term for assets and property. Unlike current assets such as cash accounts receivable, PP&E are not very liquid. PP&E are often considered fixed assets: they are expected to have relatively long life, and are not easily changed into another asset . These often receive a more favorable tax treatment than short-term assets in the form of depreciation allowances. 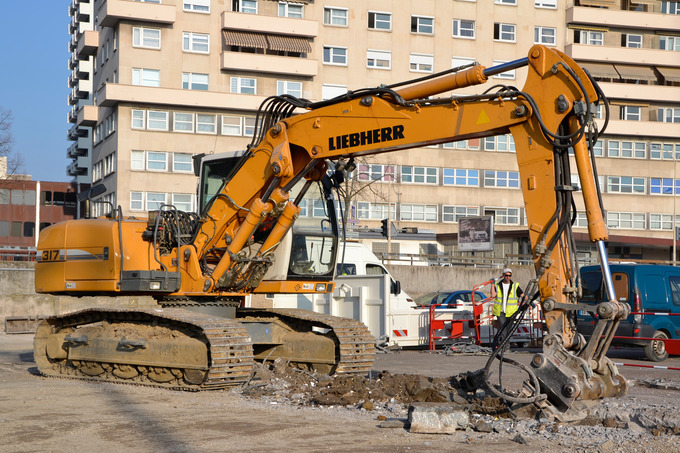 Machinery is an example of a non-cash asset. Broadly speaking, depreciation is a way of accounting for the decreasing value of long-term assets over time. A machine bought in 2012, for example, will not be worth the same amount in 2022 because of things like wear-and-tear and obsolescence. On a more detailed level, depreciation refers to two very different but related concepts: the decrease in the value of tangible assets (fair value depreciation) and the allocation of the cost of tangible assets to periods in which they are used (depreciation with the matching principle). The former affects values of businesses and entities. The latter affects net income. In each period, long-term non-cash assets accrue a depreciation expense that appears on the income statement. Depreciation expense does not require a current outlay of cash, but the cost of acquiring assets does. For example, an asset worth $100,000 in year 1 may have a depreciation expense of $10,000, so it appears as an asset worth $90,000 in year 2. Amortization is a similar process to deprecation but is the term used when applied to intangible assets. Examples of intangible assets include copyrights, patents, and trademarks. ◄ Boundless: Finance: "Chapter 2, Section 1: Introducing Financial Statements"